LRT train on Portland’s 5th Ave. transit mall swings to the curbside station to pick up waiting passengers. Photo: L. Henry. 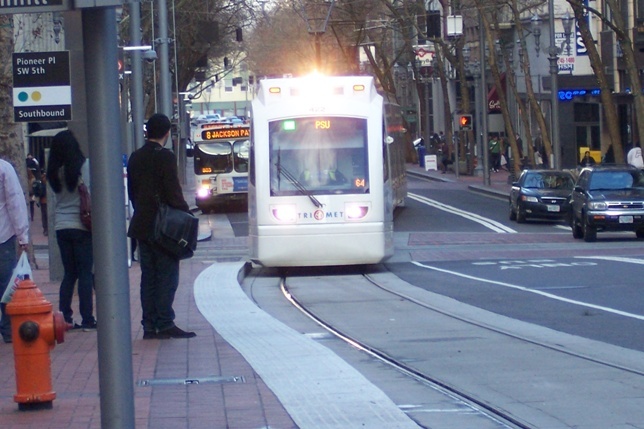 How can both buses and light rail transit (LRT) trains share the same transit-priority paveway or street? 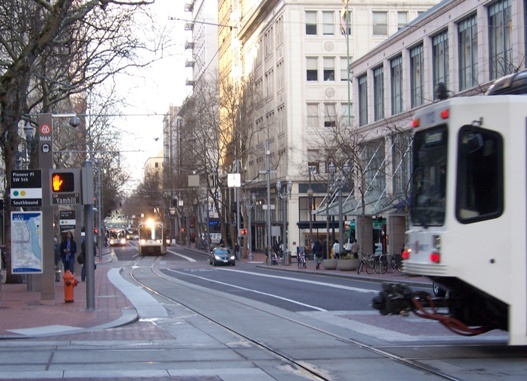 There are numerous examples that answer this, but certainly one of the best is in Portland, Oregon — the 5th and 6th Avenue transit malls. Recently, the Austin Rail Now (ARN) blog posted an article focusing on Portland’s transit malls, and because of the more general usefulness of this information for many more communities, we’re re-posting it here with the kind permission of ARN. The opening context for the article is the urban rail planning project currently under way by the City of Austin, Capital Metro (the transit authority), and a transit planning consortium called Project Connect. Transit priority lanes are now being installed on two major downtown north-south streets, and it’s been expected that urban rail trains would share these with buses, including the MetroRapid premium-bus services now being implemented in several major city corridors. However, some transit advocates are noting that these lanes may have insufficient capacity to handle all the bus routes plus MetroRapid, much less adding LRT into the mix. Portland’s experience thus provides an illustration of how LRT trains and buses can share a priority alignment in a way that works well. Capital Metro and the City of Austin have a project under way to designate “Transit Priority Lanes” on Guadalupe and Lavaca Streets downtown between Cesar Chavez St. and MLK Jr. Blvd. It’s mainly to expedite operation of the planned new MetroRapid bus services (Routes 801 and 803), but virtually all bus routes running through downtown will also be shifted to these lanes, located on the far-righthand side of traffic on each street (i.e., the righthand curbside lanes). According to a 2011 study funded by the City of Austin, the Official (City + Project Connect) Urban Rail route is also envisioned to use these lanes downtown. Alternatives to the Official plan have also assumed that these routes would be available for alternative urban rail lines serving the Guadalupe-Lamar corridor. However, there are legitimate questions as to whether these two lanes could simultaneously and effectively accommodate the two MetroRapid bus routes (10-minute headways each) plus all other Capital Metro routes (various headways) as well as urban rail (10-minute headway), all running in both directions. 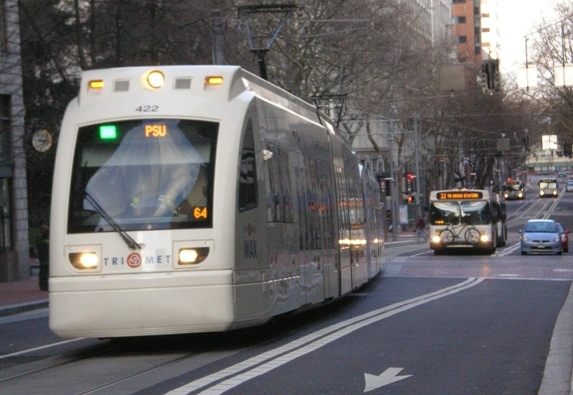 Experience with both light rail transit (LRT) trains and buses sharing the same running way is rare in the USA, but one of the best examples can be seen in Portland, Oregon. For years, 5th and 6th Avenues through the downtown have been used by multiple bus routes as a transit mall, with a single lane provided for general motor vehicle access. In September 2009 LRT was added with the opening of the new Green Line; see: Portland: New Green Line Light Rail Extension Opens. The integration of LRT with bus service in the 5th and 6th Avenue transit malls has worked well. Here’s a brief photo-summary illustrating some of the configurational and operational details. This illustrates how both bus services and LRT trains share the mall. Tracks, embedded in the pavement, weave from curbside to the second lane over. A third lane is kept open for mixed motor vehicle traffic. 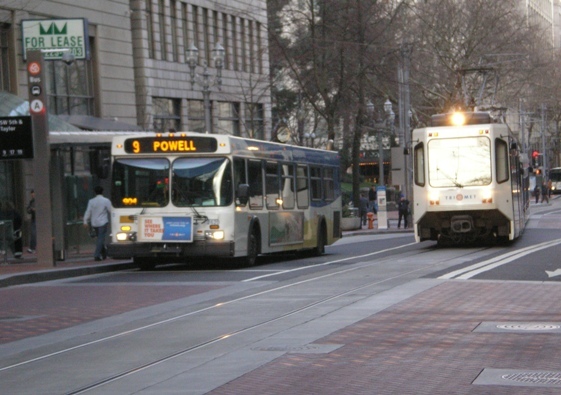 Portland 5th Ave. transit mall. Photo: Dave Dobbs. 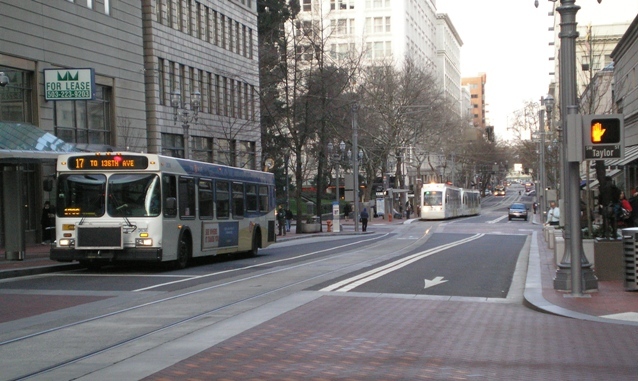 This photo shows how the Green and Yellow LRT lines on the 5th Ave. transit mall cross the Red and Blue LRT lines running on 5th St. You’re looking north on 5th Ave., and just across the tracks in the foreground, the LRT tracks on 5th Ave. weave from the middle of the street over to the curbside, where a station-stop is located. This allows LRT trains to access stations but otherwise pass buses stopped at bus stops on the same street. Portland 5th Ave. transit mall. Photo: L. Henry. Here an LRT train has just left the curbside station, following the tracks into the middle lane of the street. This track configuration allows the train to pass a bus boarding passengers at a stop. Another train moves to the street center lane and passes the bus stop. Meanwhile, other buses queue up at the street behind. 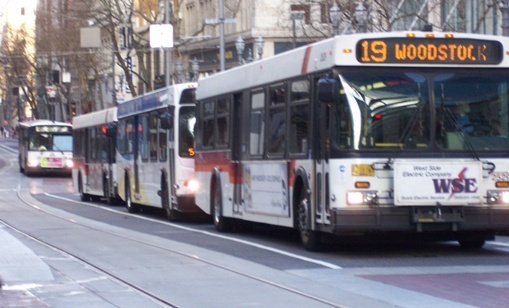 Buses are prone to “bus bunching” (queuing) in high-volume situations because of their smaller capacity, slower operation, slower passenger boarding/deboarding, difficulty adhering to schedule, etc. However, notice how they’re channeled to queue up in a lane off the LRT track.